"Floral subjects are simple and offer clear references, but as a strategy they are, of course, just starting points. In painting, the stationary yet strongly spatial quality of house plants, the vitality of their greenness and growth, seem to lend themselves well to different methods of representation." 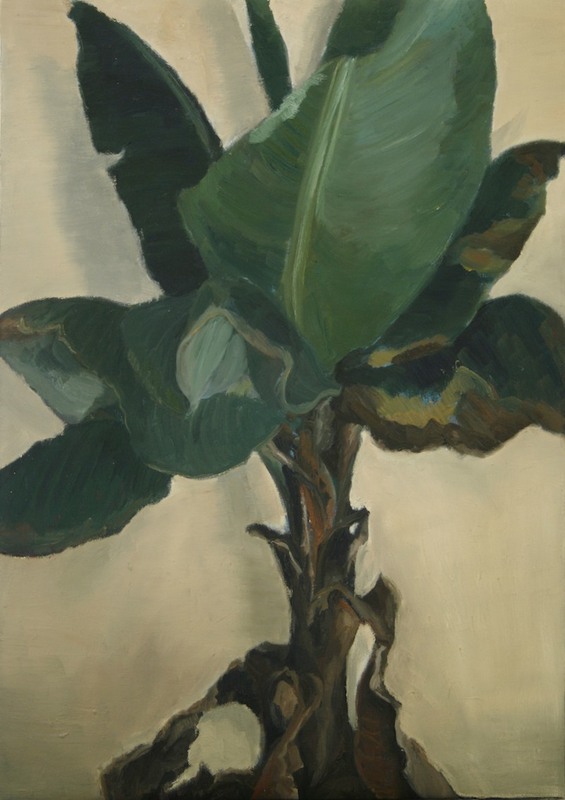 In several of Lenkkeri´s works, house plants are depicted as radiating vitality and life. Their leaves, in different shades of glowing green, tremble with vigour and reach out beyond the canvas. The material feel is strong. This derives from Lenkkeri´s use of thick layers of colour and her varied use of the brush, from delicate detailed marks to rapid strokes indicating power. Sometimes her floral subjects become subordinate to purely abstract pictorial values - to autonomous use of colour, to the description of tensions between forms and structural processes. Banana tree, oil on canvas, 80 x 50 cm, 2009-2010, private collection.